Carrying around your large wallet can a be a pain. Make it easier by combining your wallet with your phone! These little phone wallets are perfect for an ID or important credit card you need to keep with you at all times. This small phone wallet is made of a leatherette material that is to die for. It fits up to 1 or 2 cards / IDs snugly. It is the perfect thing for a college student or worker who needs to access buildings with an ID. It measures at approximately 2.375" x 3.125" and fits most newer smart phones. Be sure to measure your phone in order to receive full satisfaction. The phone wallet sticks to your phone with strong adhesive. 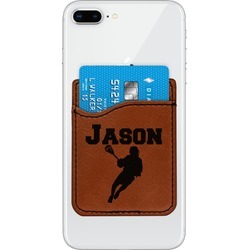 Personalize your phone wallet with a fun graphic or monogram from our system. It will be laser engraved with whatever you choose! It's that easy! But if you need any help we are here every step of the way. Don't hesitate to contact us with any questions. Wanting a little more color? 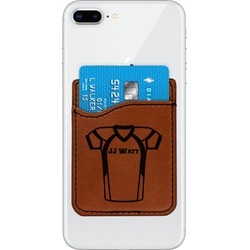 Check out our other cell phone credit card holder. Be sure to check out our computer and phone section as well to see the rest of our cell phone accessories.